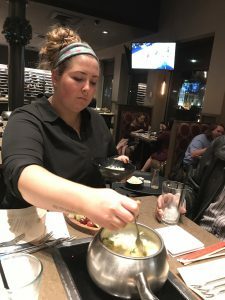 On Friday Nov. 30th VSSJ sponsored a dinner out at the Melting Pot to celebrate World Vegan Month. To say we were blown away by the experience would be an understatement. 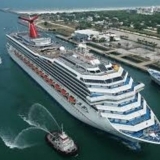 We had an incredible time! 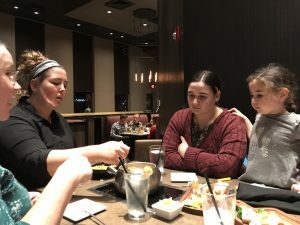 We were so surprised at not only the quality of the food, but of the whole entertainment value of the dining experience. It was a meal and a show all rolled into one. 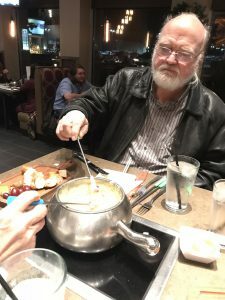 The first part of the meal was a cheese fondue. 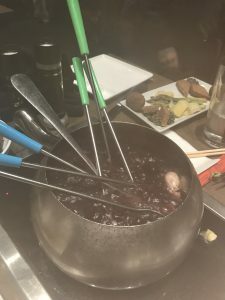 You could choose either a vegetarian or vegan fondue. Most of the food was prepared right at our table. 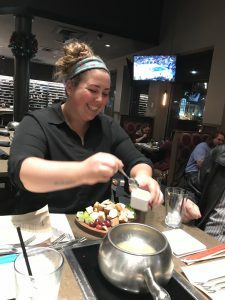 Our server was fantastic! 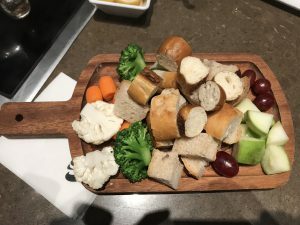 A perfect combination of dipping options to choose from for the fondue! 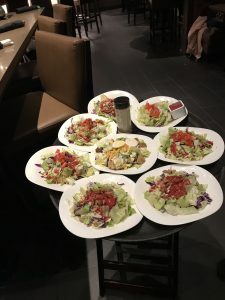 Our second course, a salad. 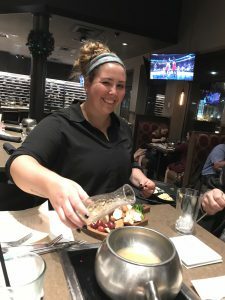 Our third course – another fondue! Another great assortment of options to use for the second fondue. 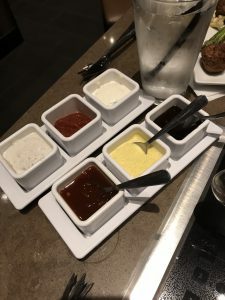 Plenty of sauces to choose from – yum! 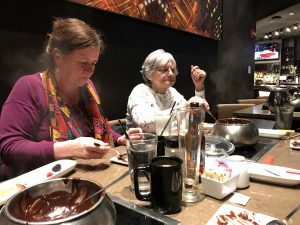 The fourth course – Chocolate! 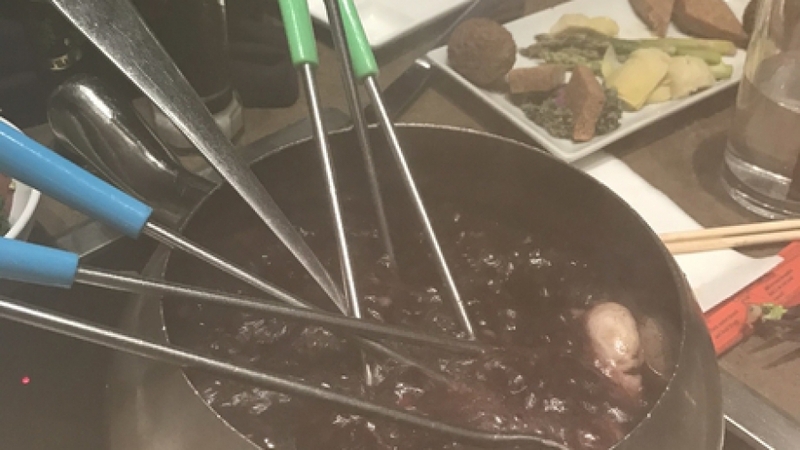 The chocolate fondue was delicious, as was the nice variety of fruits provided to dip into the chocolate! We ordered the four-course special, you could choose either vegan or vegetarian. 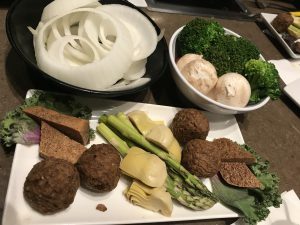 VSSJ applauds The Melting Pot for offering so many vegetarian and vegans options. Consider this restaurant for your next dinner out! 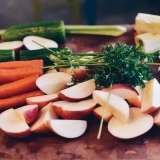 Have a favorite dish at The Melting Pot you think our members should try? Let us know in the comments, below.